Photo frames, books, or small objects can be displayed on the ledge to make your personal gallery at home. 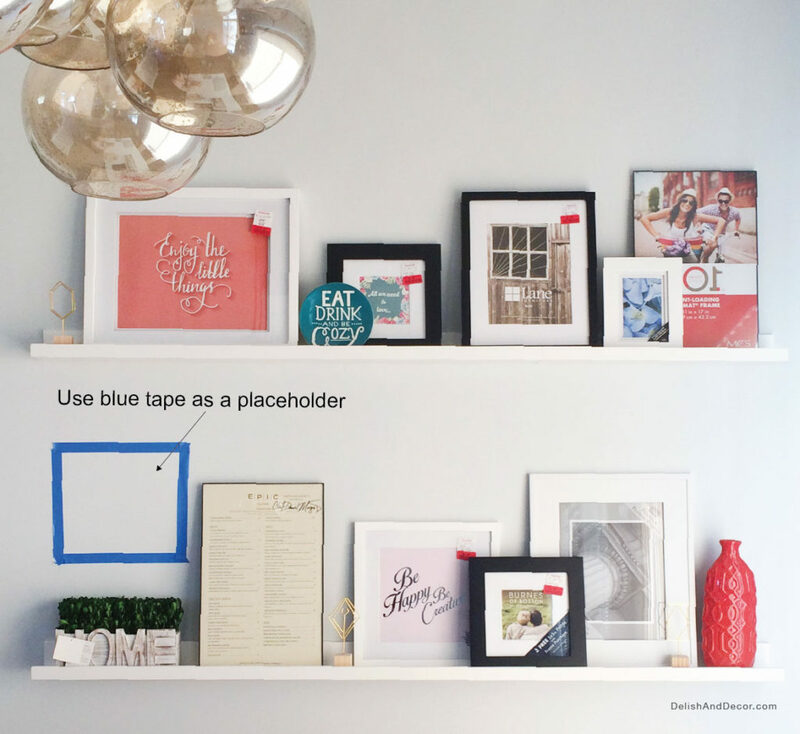 There are so many ways to style picture ledges on the wall. 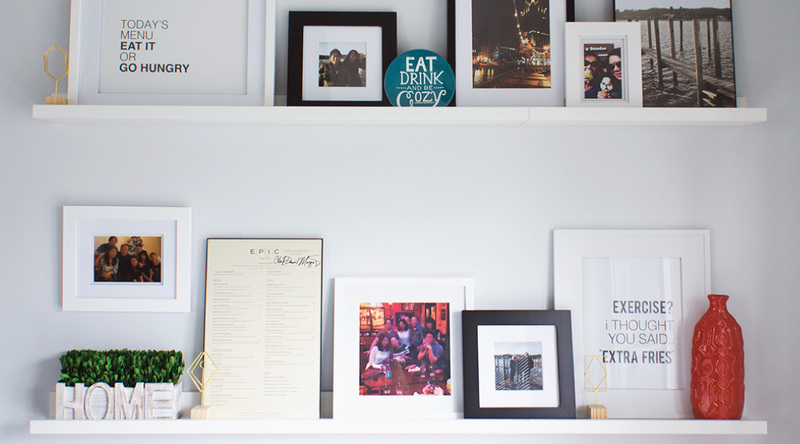 But for this post, I will show you how I styled my picture ledges in the dining space. First, measure the entire wall area, from the top to the bottom and side to side. I found picture ledges from ikea. they are inexpensive and easy to install. 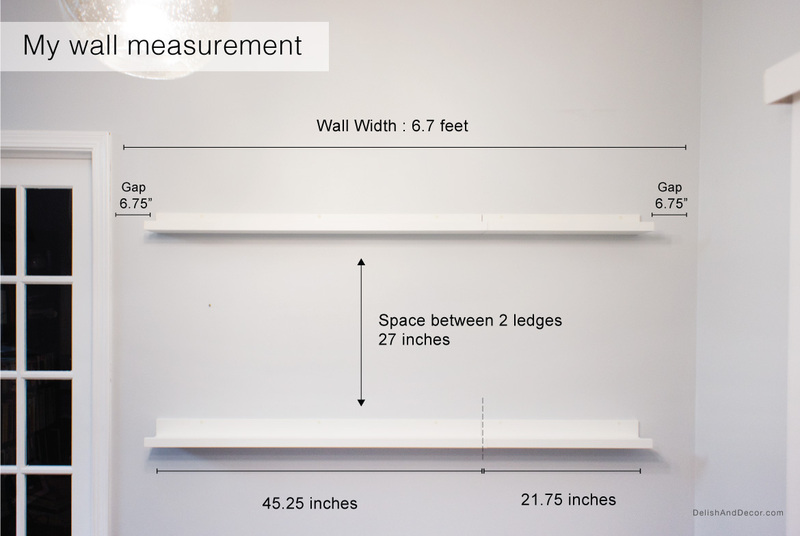 From ikea website, there are 2 sizes of the ledges: 45.25″ and 21.75″. Combine both sizes, I will get 67″ in length and that is long enough for the wall. It also leaves 6.75″ gap between the wall and the end of the ledge on both sides. So I bought 4 ledges (2 long ones and 2 short ones). It’s a good idea to buy extra just incase you need more. The dotted line is showing where the long and short ledges connected. To get the spacing in between the 2 ledges, measured the tallest photo frame or object that will be placed on the ledge. In this case my tallest photo frame is 17 inches. I know that I want this area to feel light and airily, not tight and clutter. So I added 10 inches from the top of the tallest frame that will be placed on the bottom ledge. That is how I got 27 inches between the ledges. When buying frames, I would buy them in the same size or in a set (a set of 2, 4, etc…). This will help when placing them on the ledges to create a cohesive look. 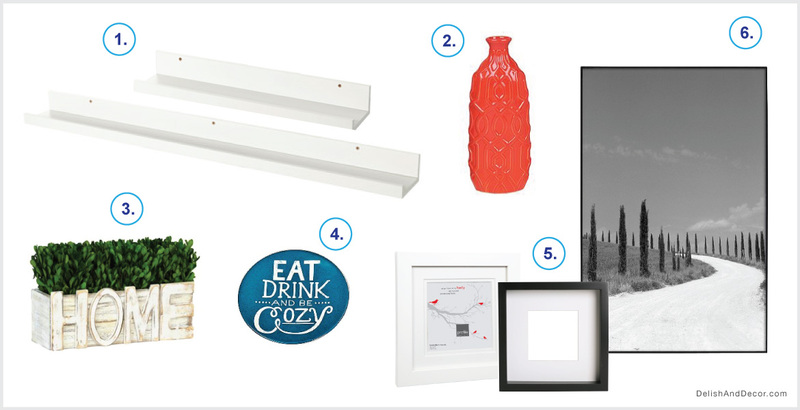 Most of my photo frames are from HomeGoods. The prices are in between $5-$10 by the clearance section (all red stickers). It’s really a good deal! Except the 2 thin black frames – I got them from Target. I like to apply the grid system with the designing. I also use the same idea and apply it to how I place the photo frames. I use diagonal system by placing the matching frames close to the end of the edge and across from each other (see the orange line and the blue line). It creates structure and framework. This helps balance the overall look of the display. Then, adding smaller frames to create interesting visual and negative space. In order to get light and airy feel, I picked black frames in smaller sizes. Thick black frame can feel heavy. All of my frames are black and white. I wanted to add some pop of colors to the wall with decorative objects. 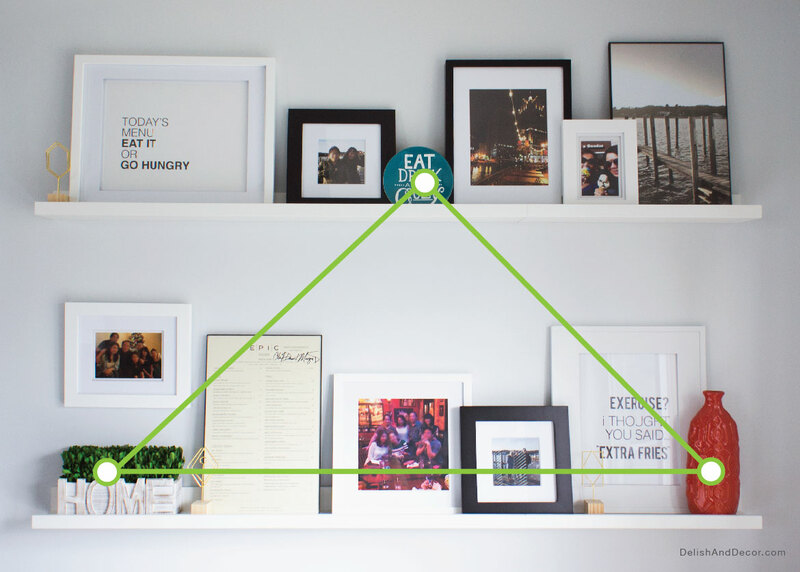 Using a triangle outline helps with the placement of the objects. Create personality by mix and matching family photos and funny word typography. It makes me smile every time I look at them.